Laporte, G. and J. Mackie. (edited by) 2010. Building the African Union An assessment of past progress and future prospects for the African Union’s institutional architecture. (Policy and Management Report 18). Maastricht: ECDPM. The Nordic Africa Institute (NAI) and the European Centre for Development Policy Management (ECDPM) are very pleased to present this publication. It is the fruit of a joint initiative supported by the 2009 Swedish EU Presidency and has been produced in close cooperation with the African Union Commission in Addis Ababa. It comprises a collection of papers presented by African and European policy-makers and researchers at an informal, high-level seminar held in Uppsala on 21 October 2009. Part I of the report takes stock of the key challenges facing the AU and analyses its track record since 2002. As a pan-African institution, the AU has made substantial progress in taking a stronger lead in the integration of the African continent and in global fora. However, it still has a long way to go before it can claim to be both effective and influential. The authors present a list of concrete action points for strengthening the AU and its institutions. 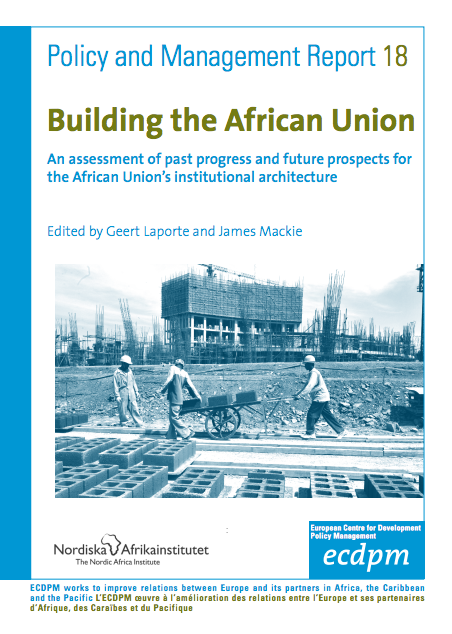 The final part of the paper contains an analysis of the role the EU could play in supporting the AU’s institutional development. A great deal of progress has been made in recent years in terms of broadening and deepening AU-EU relations, for example with the formulation of the Joint Africa- EU Strategy (JAES). However, there is an urgent need to strengthen the political foundations of the partnership between the EU and Africa by addressing delicate issues of common concern and interest. The upcoming EU-Africa Summit (November 2010) and the new EU external action framework created by the Lisbon Treaty provide unique opportunities for moving forward in this respect. Part II of this report consists of the four background papers that were presented during the Uppsala seminar. The first session of the seminar concentrated on the AU’s role in promoting African integration and the progress made in the last few years. In his paper, Adebayo Olukoshi of the IDEP2 critically reviewed the current campaign to promote African integration, based on an assessment of past efforts. The end of the Cold War, the accelerating pace of globalisation and the end of apartheid have combined to give momentum to the revival of regional and pan- African initiatives. The AU was created at the start of the new millennium, and equipped with a new Constitutive Act and institutions, giving fresh impetus to African integration and unity. However, many big challenges remain, including the lack of consistent African political support for integration and heavy dependence on donor support. Adebayo Olukoshi’s paper concluded with a number of recommendations for enhancing the AU’s institutional architecture. A strong AU Commission or Authority, endowed with the necessary political clout, capacities and resources, should be able to assume a driving role in the continental integration process. This is not simply a technical question, but an important political issue that will require strong leadership and strategic vision. Like-minded African countries need to be prepared to pool their sovereignty and entrust their collective sovereignty to common institutions that are given appropriate powers of action. The second session focused on the ongoing reforms that are designed to strengthen the AU institutions. In his background paper, Fredrik Söderbaum of Göteborg University/ UNU CRIS3 gave an overview of competing perspectives in the debate on the AU and African integration. He identified two dominating and partially overlapping schools of thought on African integration: the EC/EU institutional model, suggesting the universal potential of regionalism, on the one hand, and the pan-African vision of integration on the other, in which Africa ‘must unite’ in order to overcome marginalisation and underdevelopment, and benefit from globalisation. The author juxtaposed these two models with the more sceptical and critical perspectives of ‘regime-boosting regionalism’ and ‘shadow regionalism’, inspired by different logics from the two other models. High-profile conferences on regionalism, culminating in the adoption of forceful formal declarations (‘summitry’), and a large number of competing and overlapping regional organisations may be part of a deliberate strategy to boost the opportunities for verbal regionalism and regime-boosting. Shadow regionalism is an informal mode of regional interaction, built upon rent-seeking or the stimulation of patron-client relationships.